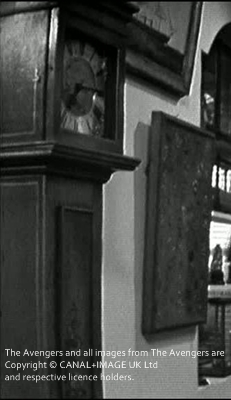 Two longcase clocks appear in Steed's flats. 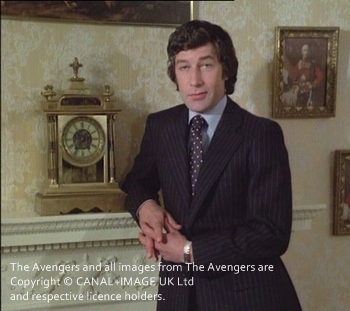 The first one appears in the second flat, but can be seen for only one episode (The Nutshell), the next and second longcase clock, a George III. 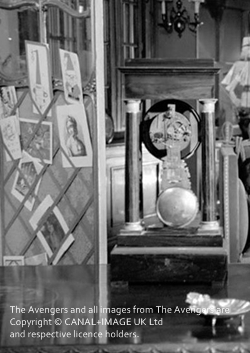 longcase clock had its place in Steed's living room from set one at Steed's Stud. 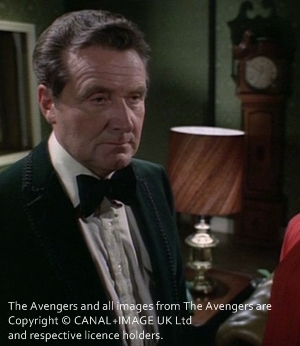 It got removed later for a cabinet for Steed's Bone China. 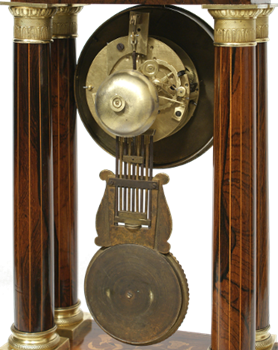 Too Many Christmas Trees: one can see the backside of a mantel clock, mid 19th century with a wooden rectangular base. 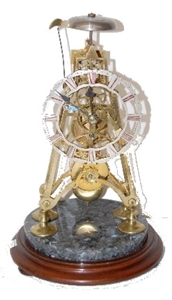 It stands on four conical pillars with brass capitals that hold the central movement; on John Steed's desk/secretary in his third flat stands a gilded and blue clock as seen in many episodes such as Honey for the Prince or How to Succeed At....Murder.The clock is gilt bronze and jeweled Sèvres style mantel clock from the late 19th century, surmounted by a gilt-decorated vase with twin mermaid-cast handles. The dark blue vase on top is painted with a figure of Venus and her attendant. The lid of Steed's vase is missing. 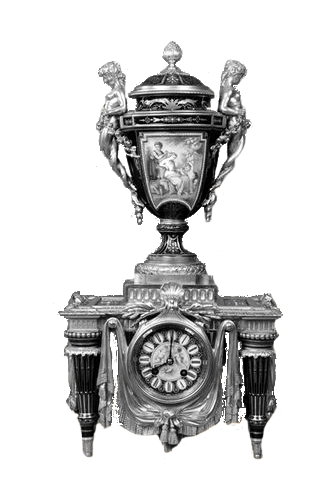 It's raised on a rectangular gilded pedestal centered on the front with a circular dial painted with cloud-borne, sides each with a porcelain plaque; it's standing on porcelain toupie feet. The dial shows Roman numerals. Two mantle clocks in 3 Stable Mews (left) and Steed's Stud. The left one was a gift from Tara for Steed in Pandora. At the beginning of the episode, Tara is looking for a 17th century French Bracket. 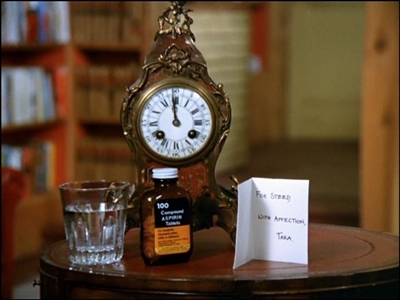 The present for Steed is an unusual clock. It has a full Westminster chimes, but it is so loud that Steed gets a massive headache. The right one can be seen in TNA House of Cards or TNA The Tale of the Big Why. A brass and maybe gilt mantel clock with gilded decoration and Corinthian columns to corners. 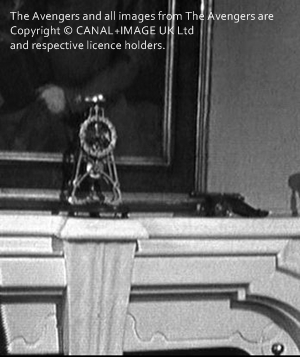 Skeleton mantle clock on Steed's mantlepiece in his second flat at 5 Westminster Mews. 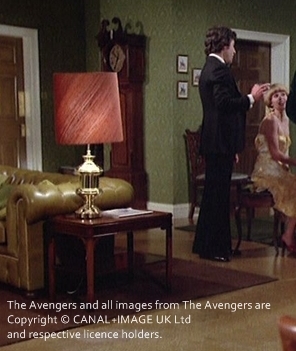 It's gone in the last episode of series 3, Lobster Quadrille.